Holidays with children in Sardinia are more fun when you’ve got access to spaces specially designed for the youngsters! At Camping Cala Ginepro, we really push the boat out to meet children’s needs. 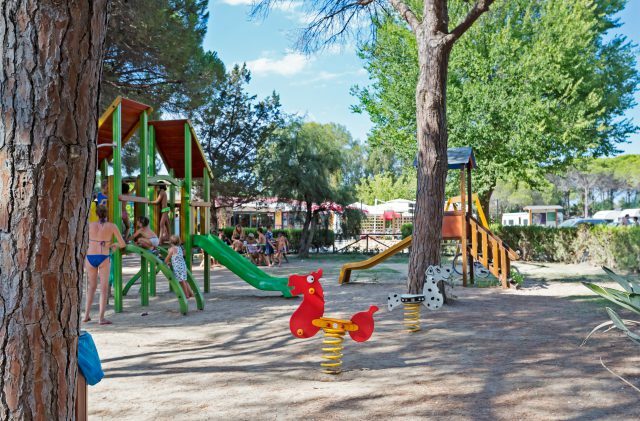 That’s why we have set aside an area of the campsite, and equipped it with a playpark where they can play to their hearts’ content in the peace and tranquillity of the pine forest. The children’s playpark is located opposite the bar, next to the restaurant. As a parent, you can sit back and watch as your children have the time of their lives. From mid-June to the end of August, various activities are laid on for children in the playpark. These activities, which are free, are run by the entertainment staff during the mini-club times and include: educational walks, workshops, making things, children’s dances, games on the beach, sports, kids’ football, experiments and much more besides. Children are, of course, under no obligation to attend. For your holidays with your children in Sardinia, Camping Cala Ginepro is the ideal place for moments of great fun and relaxation. Facing out over the crystal-clear sea, which has a gently sloping seabed, immersed in pure nature, amid pine, eucalyptus and fragrant juniper trees, the campsite is the perfect environment for even the youngest of children!